Izzy's offers a full selection of scooped and soft-serve ice cream and frozen yogurt. Our rich and creamy ice cream and low fat frozen yogurt are made by two local dairies. Our flavors range from the classic rich vanilla to Salted Caramel Chocolate Covered Pretzel. Our staff is ready to help you have the perfect ice cream shop experience. Feel free to taste any flavor and be sure to ask any questions about menu items or even suggestions for Portsmouth restaurants. 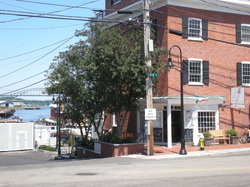 Located at 33 Bow Street on the waterfront, our windows look out over the Portsmouth Tugboats and the Piscataqua River. Our corner is a gathering place on sunny afternoons or summer evenings.